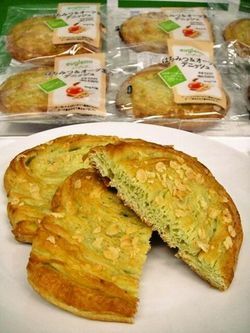 A honey-flavored Danish into which Euglena was kneaded, and fragrant oats are used as topping of it. It contains 300 milligrams of Euglena, but its flavor isn’t strong. 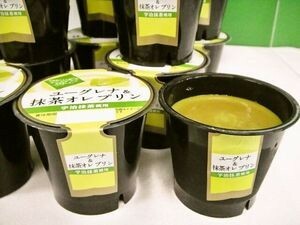 It is a pudding with a creamy powdered green tea flavor, and its texture is smooth. 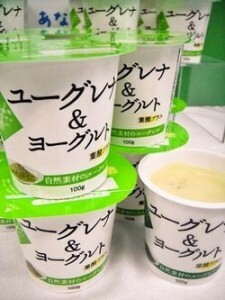 The flavor is enhanced by synergy of Euglena and powdered Green tea. The pudding melts in your mouth smoothly; you are sure to love this texture, so you can’t stop eating it. This dessert is a kind of smoothie and has three tastes. 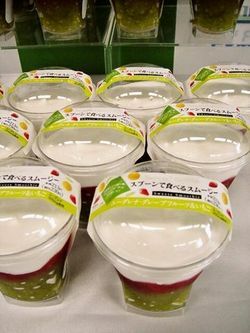 It contains 300 milligrams of Euglena; sweet-sour diced strawberries and strawberry sauce are used as topping on grapefruit jello with pulp which contains Euglena. Then a generous amount of fluffy whipped cream is added on top of it as the final touch. Though it is heavy, it tastes good with its light flavor. I recommend that you enjoy the three tastes at the same time, scooping all of the three layers with a spoon. It contains kiwi, aloe, 300 milligrams of Euglena and 300 micrograms of folic acid. 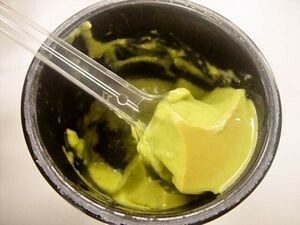 When you take a bite, the rich flavor and taste like “kombu soup stock” spread on your tongue. It slightly tastes like green seaweed, but it is very easy to eat and tasty. In the future, many kinds of Euglena sweets will be sold at convenient stores in Japan.